The Vatican has upheld Fr. Pavone's appeal. As you may know, Fr. 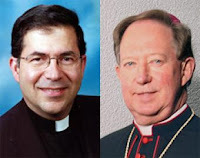 Pavone was ordered to return to his diocese in Amarillo, Texas by his Bishop. It seems to be that his Bishop wants to keep an eye on him and Priests For Life, an organization which fights against abortion by training priests and others on the topic and how to speak out against it. No one really knows the reason why this Bishop is doing this. Some speculate it is due to charges of misappropriation of funds by Priests For Life. Most likely, this is an attempt by the Bishop to control Father Pavone's activities which can sometimes be borderline political.